PureVPN is reputed as one of the best VPN providers with fast speeds (world’s fastest as they all say), numerous security offerings, and a worldwide server network. PureVPN doesn’t fall into the category of a minimalist VPN, or a fully fledged VPN service–but rather something in between. So in this PureVPN review, is PureVPN really that pure after all? From a pricing standpoint, PureVPN is fairly standard. It’s got one month $9.95 price tag and an affordable $4.16-month price tag for a year subscription and a half year subscription for $7.49 a month. PureVPN does offer a ton of payment options like Bitcoin, and other forms like AliPay, and PaymentWall, which is very nice to see. While no free trial options are available, there is a seven-day money back guarantee. However, this refund policy is pretty crap. I’ll go over that in the support section later. 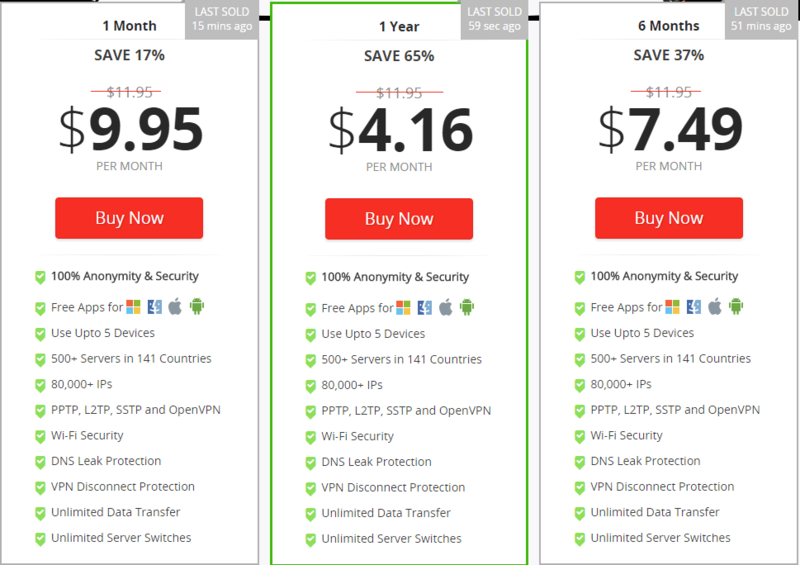 PureVPN also has numerous add-ons to up the pricing considerably with servers like dedicated IP ($4.99/month or $5.99/month for extra DDoS protection), dedicated streaming add-on ($4.99), StealthVPN browser ($4.99/month), Web Protection & Nat Firewall ($4.99/month), and SmartDNS ($2.99). Some of these features like Nat Firewall are already embedded into a lot of popular VPN providers, so it’s disappointing to see it as an add-on that costs extra money per month. Check out this list if you want to know the cheapest VPNs. 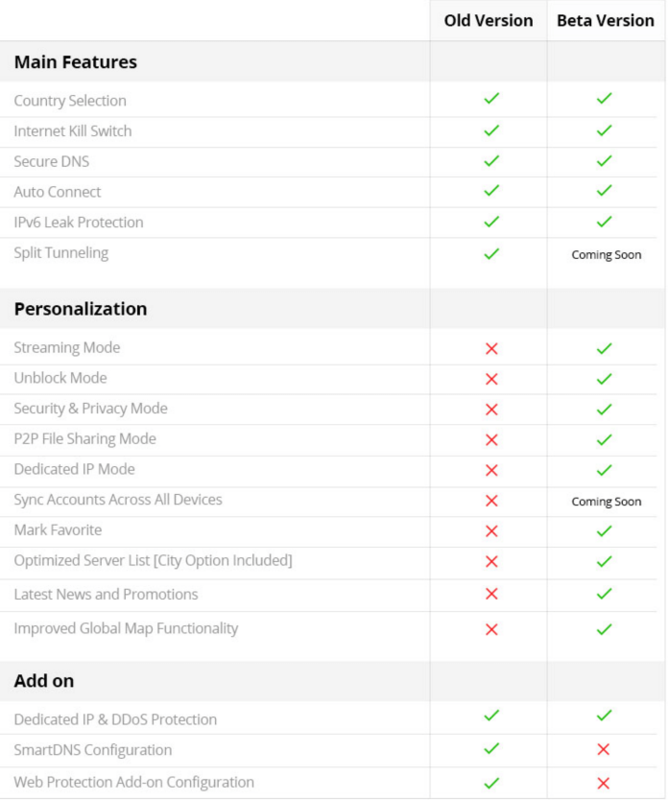 Now that the good news is over let’s take a look at PureVPN’s software. Unfortunately, while I think PureVPN was on the right track with a lot of things they tried to implement, the results often feel clunky, unresponsive, or just plain wrong. The overall design of the application reminds me of old Windows anti-virus programs or some skeezy popup. The colors are an odd form of washed out green, and it doesn’t help that the main logo icon in the top left has social media icons. There’s even a small add in the bottom left corner that encourages you to get a premium version PureVPN. I also hated how it wanted me to rate the VPN service after every VPN connect/disconnect. While I wasn’t a fan of the general interface, I did like the lengthy tutorial that lets you click through slides if you want information on how to use the application. If you can get past the design, you might be interested in in how the application works. The only problem is that once you sign up and pay, it takes close to an hour to receive the credentials that you need to log in. I’ve never seen anything like this before with a VPN which resulted in me trying to login over and over into the application before I realized I needed an email I hadn’t received yet. By the time you get all of your emails, one will be your payment confirmation email, one is the email you need, and the last one is just promotional crap that explains why you should use a VPN and how. Luckily, this last email does contain tutorial links if you need them. This sent information is separate from the site’s information and the account you created. I hate when services do this–don’t we have enough passwords and accounts to juggle already? Why do I need two for this VPN? Not to mention that logging in on Mobile requires the same thing so make sure you have your email login credentials handy as well as the account information you initially create on the site. There’s client login, and account login–that is how I see the separation. Once you manage to log into PureVPN, you’re going to have to battle the application’s server interface. In some ways, the ideas within seem smart, but the execution and practicality aren’t. You can personalize your server connection in the Personalized Selection section by choosing your VPN purpose (what do you mean my purpose–I want VPN for everything!). So it’s up to you to chose that use you value more, whether that means Netflix in the USA, for data retention security, or anonymous file sharing. A couple of the purposes I tried within the personalized section didn’t even hide my IP address, which hints at DNS leaks–namely anonymous sharing didn’t work while data retention did. I made sure to select OpenVPN-UDP connection as my preferred protocol (even though the application starts with an automatic protocol–that is what exactly?). Once you get this far, you have to pick your location that you want on the map. It’s a long process to get connected to a VPN–made longer by the extended connection time from the app itself. If you’re wondering why some VPN providers have an application so simple you only have to click a few times–now you know why. That said, you don’t have to personalize your server if you don’t want to. You can just connect through the main dashboard “system at a glance” but you still have to pick your protocol (or just leave it at automatic–I would recommend OpenVPN-UDP). From this tab, you have the joy of sorting through all of PureVPN’s extensive server list to find the server for you. I never did manage to find a San Francisco server. PureVPN tries to pack a lot into its software with extra things like SmartDNS, Web Protection, Split Tunneling, and a Virtual Router feature. Most of these services don’t seem that useful (and some like SmartDNS require an external addon download–plus extra payment), and when I tried split tunneling my IP address wasn’t hidden. Virtual Router was surprisingly easy to set up, but I had the same issues with my IP address. I thought it might be a problem with the protocol I selected (the program insists on turning on automatic protocol for some reason) so I restarted the application but forgot to turn run it through administrator privileges (these add-ons require that). So I relaunched the app, picked the protocol, and launched the Virtual Router, tried to connect my phone, but then the app crashed. As far as application settings go, the app does have a Kill Switch (although it’s in Beta) and options like switching to a secure DNS (again requires admin rights), and options to change your encryption. I’m not sure why the default selection has encryption disabled–after all, aren’t we using VPN for encryption purposes? A feature I wouldn’t have minded unchecked at default is the launch on system startup (for some reason the application insists on re-checking this as well so everytime I start Windows it comes back like a pop-up). It’s also hard to close down since every time you exit the application it insists on staying active and not closing–even when I click exit Windows on the active taskbar icon it likes to give me a notification it’s still on. When the stars align, and I managed to pick just the right server, and the proper protocol, I managed to hide my IP address and get decent speeds. However, if you’re looking for an easy-to-use, easy-to-setup software experience, PureVPN’s standard client might leave a bad taste in your mouth. PureVPN has also released a new beta software this month which feels different than the older application in a few ways. The main differences are in the user interface, as the new application takes a user-friendly tile approach that lets a you pick which type of connection they want and why. While this customized approach could be useful, I still think many of you will wonder why you need specific protocols or ways to connect when other VPN providers just provide a one button solution. In fact, that’s what PureVPN is pushing–that, connecting in the new app is just one click away. It’s a bit more than a click as you still have to search through a long server list and pick the protocol that you want. It is handy that it gives you some information on the different protocols, but some of the information seem a bit off. I selected the security connection and it wanted me to pick L2TP over UDP which isn’t really that good of a tradeoff. L2TP isn’t the most secure protocol. The global map inside the application looks and feels much nicer now with better organization, as well as animations and colored backgrounds with just the right amount of opacity. A lot of the bad things about PureVPN’s old software still remain–like not having the best encryption turned on (I suppose it can be nice for those looking for faster speeds, but I still think a lot of you won’t look for this and assume they already have 256-bit encryption enabled), or having a more automated server selection near your location (why can’t it just tell I’m in the United states? I shouldn’t have to pick a server unless I specifically want to). PureVPN’s new software looks great, and because of that, it functions better too. I had a bit of an issue logging in at first, but after waiting 5 minutes, it let me log in. I guess it’s still in beta? PureVPN’s new application still wants to personalize connections for you–and if that’s something that’s important to you, whether you want to stream, have security & privacy, or file share–PureVPN might be a good fit–even if most VPN’s can do most of these things well without personalization or making you chose one preference over another. I was hoping for some simplicity in the mobile software, but the same disappointments carried over from it’s Windows counterpart but with more limitations. You still have to log in twice here if you want access to everything, and the interface in the application barely works at all. There’s a slick looking tab you can pull out, but a lot of the time you get stuck in the server browser menu. Pressing “Cancel” doesn’t get you out, and I had to restart the application and re-login just to get back to the connection page. Sometimes things work better, but you still don’t have a convenient easy-to-find server connection that just picks the closest/fastest server nearby. I ended up picking somewhere in Afghanistan just to get it connected. The only real option is to change the protocol from manual to auto (which I would suggest since PureVPN doesn’t like to default OpenVPN-UDP for some reason). Overall the application was a huge let down with multiple crashes, an annoying set-up, and clunky server connection and browsing. 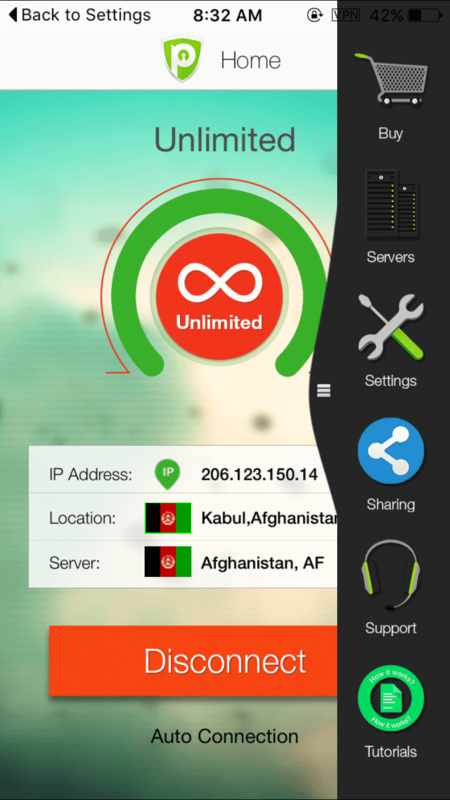 If you want a good mobile app, check out IPVanish VPN, TorGuard VPN, ExpressVPN, or Private Internet Access VPN. PureVPN does have a lot of extra services you can add through checkout such as a StealthVPN browser, Dedicated Streaming, Dedicated IP (and with DDos protection available at a higher price point), SmartDNS addon, and Web Protection & Nat Firewall. A lot of these features/services aren’t seen in other VPNS, but each one adds a considerable amount of cost to the overall VPN service. Things like Nat Firewall should be included as discussed earlier, and I’ve seen things similar to SmartDNS, but dedicated streaming promising 20 Mbps on any internet connection seems very interesting but almost too good to be true. Five simultaneous connections are decent and nice to see. Apparently the dedicated streaming service gives access to a special PureVPN virtual web browser to boost your speeds. Since I already have around 20 Mbps connection, it would be hard to test out–but every other review out there only glosses over this feature, not providing any evidence that it works, or how it functions. If you dig a little deeper, you’ll find information on PureVPN’s website that the add-on only supports a few services like NBC, SyFy, Fox, CBS, and HBO. There also isn’t any information if this addon/module supports encryption. The StealthVPN browser feature seems neat, but there isn’t much information on what it does besides boosting speeds on location. I would rely on it for security needs. It might be useful for getting a firewall at school or something. I did really like seeing options to get a dedicated IP address, however, since not many VPNS provide this. PureVPN’s website feels very standard, with a modern design, plenty of graphic images and reasons to entice people into using VPN–but it also has excellent tutorials with images inside the support center. The blog is a bit spastic, and the website cluttered with said reasons to use a VPN, but overall the site gets the job done. I wish there were more information about some of the unique extra services they offer, so they don’t come off so much as gimmicks. When logging into the website you have access to this basic dashboard where you can find your information. I like this visual approach to an account. PureVPN advertises that it has a lot of servers, and while I found the server list within the application to be extensive, it’s not easy to navigate to find the server that you need. There are plenty, and the ones I tested worked decently. This is more of a problem with the interface than the servers themselves, so take that as you may. PureVPN has all of the standard protocols available for use including PPTP, OpenVPN, L2TP/IPSec, SSTP, and SSL. As far as encryption strength goes, they have 256-bit encryption strength–although, in order to find this information, I had to first find a rep to find it for me (why they don’t make this information readily available on the front page amazes me). Updated: I’ve changed my privacy rating, since despite the available encryption and protocols, PureVPN just keeps getting hacked! A new updated speed test of PureVPN in 2017 gives us average speeds of nearly half of what it should be. TorGuard, one of our top-rated VPN providers, is roughly TWICE as fast as PureVPN. PureVPN gave us 43 Mbps for regular speeds, and 44 Mbps for BitTorrent. At first, I thought PureVPN’s support response was pretty impressive. They answered me with a live chat response within a few minutes with a large detailed (probably copy-pasted from somewhere) response above dedicated streaming. I didn’t like how I had to fill out so much information since some VPN providers barely require any (Torguard for example). The issues arose when I actually needed some real support. I filed a refund through their agent who directed me to a page, and from there I waited two weeks without receiving an answer only to have my issue be closed. I browsed around on the website to see that my account was still active as well, and it would bill be for another month (now in only a couple more weeks–what’s left of my subscription). Even after checking on the website manually, there was no way to cancel this subscription so I was at the will of the support system. I decided to chat to another rep (who was a bit slow to respond at first) about the issue, and he looked into my ticket number. He explained that I somehow managed to cancel my ticket, and he told me how he reopened it. I then received an email a week later explaining how I shouldn’t cancel my service and no mention of a refund. That ticket had a closed status as well. I decided to chat with a rep one last time, but the fellow told me I had never asked for a refund, and now that it was 7 days after my purchase, there was no way for me to get a refund. In the words of a gamer, “GG”. PureVPN has the backbones of a good VPN service, with a lot of servers, good speeds, excellent support, and a decent website. It’s a ten-year-old service, but, unfortunately, everything falls apart in the poorly designed and overly complicated software. PureVPN would be better off just scrapping it and starting over making a simple application like Torguard VPN, ExpressVPN, or even PIA VPN. Sure, PureVPN has some extra services, but a lot of them won’t be used or add too much cost to the subscription fee. Thanks for reading our PureVPN review. Comment below with your experiences–head over to our forums to participate in discussion, or rate the VPN yourself to contribute to our community rating! Spark has a simple mission to help you chose the best VPN without any bias. Which VPN do I use? See it here!